You may recall that in Chapter 2 we followed U. S. Highway 95 southward from Needles to Blythe. U. S. Highway 95 is known as the "Loneliest Highway in the US." It is one of only three Highways that have not been altered or re-routed since inception. The southern terminus is at the US/Mexican border in San Luis, a few miles south of Yuma, and ends at the US/Canadian border in Eastport Idaho, over 1,500 miles from San Luis. Along the way, it makes ports-of-call in places like Scotty's Junction in Death Valley, Henderson Nevada, Burns Junction in Oregon and Weiser, Idaho. In this Chapter we will follow Arizona 95 northward from Yuma to Lake Havasu City. Along the way we will explore the river area, communities and points of interest too many to mention. The Highway heads north from the port of entry at San Luis, 20 miles south of Yuma. It is co-named East 16th Street and 9th Street South heading easterly in Yuma proper, then heads north out of town past Fortuna Road. The Gila River meets the Colorado River just north of Yuma. The Gila River is 649 miles long, and drains much of southern Arizona and even parts of New Mexico. It originates in the Black Range of western New Mexico on the western slope of the continental divide, flows westward into Arizona past Phoenix, bends around the Gila Mountains west of Phoenix, and through the Sonoran Desert to Yuma. By the time it reaches the Colorado much of its water has been diverted for irrigation, leaving it a mere stream at the confluence. Its tributaries from east to west are the San Francisco, Salt, San Pedro, Verde, and Agua Fria Rivers. The Gila served as the original boundary between America and New Mexico, until the Gadsden Purchase of 1853 extended U. S. territory southward to its present location. The Gila monster (Heloderma suspectum) is the only venomous lizard in the United States. The name "Gila monster" is derived from the Gila River basin, which is part of its territory. The Greek word Heloderma means "studded skin", which refers to the small, bony plates that appear as beads. Many myths are associated with the Gila monster, including the idea that its very breath is toxic. This may stem from a defensive tactic of facing the threat, hissing loudly and jumping at their molester. The skin color is black with intricate patterns of yellow, pink and orange beads. The Gila monster eats small rodents, juvenile birds and bird eggs, as well as an occasional other reptile. It has been known to devour the eggs of the Desert Tortoise. It kills its prey by gnashing venom, which is a neurotoxin, into the prey. It eats very large meals infrequently, storing fat in its tail. It can eat one-third its body weight in one meal, and can easily survive on three to four meals a year. The Gila monster is neither endangered nor threatened, but in Arizona they are protected from collection and/or possession. Betty's Kitchen is a Watchable Wildlife and Interpretive Trail area operated by the Bureau of Land Management (BLM). The area was named for Mrs. Betty Davidson, who worked at a café/bar that was established in the area in the ‘30's. The small, close-knit community of Betty's Kitchen existed until the ‘60's, when residential leases were prepared for all the residents. 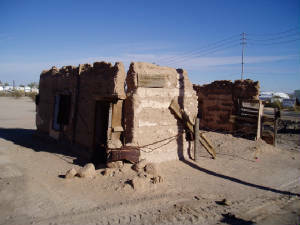 A massive flood in 1983 destroyed most traces of the community, with only one small, adobe-style house left standing about a half-mile west. The Interpretive Trail was designated a National Recreational Trail in 1993. The half-mile long Interpretive Trail takes you through dense vegetation and over a footbridge with signs along the way explaining what is happening or occurring around you. Betty's Kitchen is open for day use only. The daily fee is $10, self-paid at fee standpipes near the entrance. The site is fully accessible, and has rest rooms and trash collection. 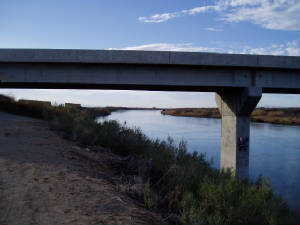 Access is by way of Avenue 7E (Laguna Dam Road) off Highway 95 seven miles north of Yuma. The road passes through lettuce, cabbage, Brussels sprout and other vegetable fields, the old town site of Kool Korners, and the Laguna Dam to the interpretive area. Vestiges of Kool Korners can be seen, including the cemetery and the former "Kool Korner" grocery store. 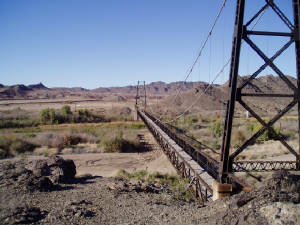 The McPhaul Bridge, or "Swinging Bridge to Nowhere", is about 18 miles north of Yuma spanning the Gila River. The 800 foot long suspension bridge was originally called the Dome Bridge, but was renamed after a local old-timer named Harry McPhaul. It was built to cross the Gila River. It was modeled after the Golden Gate bridge in San Francisco. When a dam was built upstream in 1968, the Gila River was diverted and the highway was rerouted over a much smaller bridge. A flood in 1993 destroyed the new bridge while the Bridge to Nowhere, spanning only desert sand, survived intact. The Yuma Proving Grounds (YPG) takes up vast portions of the desert landscape north of Yuma. The grounds were established in 1943 to provide for the testing of experimental desert military vehicles. The Light Armored Vehicle Test Directorate is a Marine Corps detachment that is attached to YPG to conduct tests on light armored vehicles. The purpose of the test site is to test new bridge designs, boats, vehicles, and well-drilling equipment. Much of the test branch construction was performed by Italian prisoners of war. Today live weapons test firing can be heard frequently in the area. Most (if not all) of YPG is closed to the public. Fisher's Landing Road intersects the 95 near the Yuma Proving Grounds, and heads westward to the river. Construction of the Imperial Dam in 1935 created Martinez and Ferguson Lakes and several smaller lakes nearby with names like Ice Box and Bullet Hole. While officially only 300 to 500 acres in size, in reality it is hard to tell where the river ends and Lake Martinez starts. The resort started as a fishing camp in the 50's, and has grown to a full-blown recreationist's paradise. Boat traffic in the summer months can be hectic to say the least when jet boats, jet skiers and canoeists compete for waterway space, particularly on Ferguson Lake. Bird watchers flock to the lake in the spring and fall to view and take pictures of migratory bird species. Fishermen hold sway in the winter, plying the waters silently in search of that giant whiskerfish. Largemouth bass, striped bass, and flatheads as heavy as 70 pounds live in the waters also. Safety is the Rule of the Day, as Martinez is also heavily patrolled by the Department of Fish and Game, the California Safety Patrol and the Yuma County Sheriff. The Martinez Lake Resort has Motel Cabins from $65 per day (summer) to $50 per day (winter), a Motel on the water with rooms from $75 per day (summer) to $57.50 (winter), Nomad trailer rentals from $87.50 per day (summer) to $67.50 (winter), and an RV park with rates from $20 per day (year round). Boat slips can also be rented per day. The Cantina restaurant features a home-style menu with favorites from appetizers to Char-broiled steak, pasta and salads, dessert and dancing on Saturday nights. A variety of watercraft can be rented, from kayaks to pontoon boats. More information can be obtained from their website (http://www.martinezlake.com/), by calling 1-800-876-7004, or by E-Mail at info@martinezlake.com. Fisher's Landing is about 1/3 of a mile south of the Martinez Lake Resort. The site is the original location of the early-day town of Castle Dome Landing, which at the time was the first stop for sternwheelers coming north from the Gulf of California. A post office served the area from 1875 to 1884. It was a lively town during its hey-day, but after the nearby Castle Dome mines played out there was no longer a need for the Landing. The town site was inundated by the construction of the Imperial Dam. The Golf Cart Parade on the Saturday following Thanksgiving is a popular local diversion. The Fisher's Landing RV Park has 352 spaces. River tours take place almost every day, and depart from Fisher's Landing. Lunch, full day and sunset dinner cruises on the Colorado King I sternwheeler range from $45 to $54 per person. The sternwheeler has an open upper deck for great views of the river, and an enclosed lower deck with restrooms and a snack bar. Four to five hour and six to seven hour jet boat tours travel into the Imperial National Wildlife Refuge and stops at historic sites like Norton's Landing along the way. Prices range from $60 to $95 per person. Reservations are required for all tours, and prices are subject to change. For more information call 928-783-4400, or visit the tour website at http://www.yumarivertours.com/. The headquarters for the Imperial National Wildlife Refuge (NWR) is three miles north of Martinez Lake off Red Cloud Mine Road. Imperial and the adjacent Cibola NWR further north serve to protect, preserve and restore more than 40 miles of river/riparian habitat on both sides of the river. Much of the river in this area was once cottonwood/willow forest. Many animals depended on this type habitat. But fire, woodcutting, clearing for agriculture and the introduction of exotic plants eliminated nearly all of the cottonwood/willow forests. Workers at both Refuges are working steadily to restore the native habitat. A visit to either of the Refuges today reveals much yet to be done. Salt Cedar, an introduced exotic tree, is prevalent in many areas. November 5th, 2007 marked the date of completion of the first Lower Colorado River backwater habitat restoration project. Six large ponds consisting of 80 acres of restored native habitat were constructed at the Imperial NWR by the Bureau of Reclamation. The ponds will provide habitat for the razorback sucker and bonytail chub, both native fishes of the Lower Colorado. Over the next few years two other projects will come on line in the area: A 12-acre marsh to provide habitat for marsh birds, and a native 34-acre cottonwood/willow forest. The habitat restoration program is intended to restore native plant communities along the river, which are home to 26 plant or animal species, six of which are threatened. A wetland is a very complex habitat, and so is restoring it when it becomes altered. The introduction of non-native plants is only part of the picture. Damming, water diversion and extraction, and soil composition alteration all have detrimental effects on a wetland. Damming has a particularly adverse effect because it changes a river to a lake. So-called "pulse flooding" (occurring during spring thaw) doesn't happen anywhere near as much as it did before the dams. So many rivers world-wide have been tamed by damming that examples of a natural hydrologic flow regime are few. To achieve success, any restoration project must account for all of the natural and man-made processes that led to the alteration of the native habitat. The Painted Desert Trail is off Red Cloud Mine Road north of the Visitor Center. An interpretive brochure and map can be picked up at the trailhead. The 1.3 mile long loop trail is of average difficulty, with some moderate short climbs and uneven terrain. Volcanic activity 30,000 years ago left a rainbow of colors along the trail. The trail also features water-eroded columns of rock called "hoodoos", fine examples of Sonoran Desert plants, and a scenic view of the Colorado River Valley about half-way through. If you visit in the spring, and there was adequate rainfall the previous winter, there may be beautiful displays of desert annual flowers. The desert flowers are quick to take advantage of favorable conditions. Given adequate winter rainfall, they will bloom in later winter or early spring, sometimes as early as February. By the time the summer heat has set in, their life cycle is complete and their seeds have been sown. Red Cloud Mine Road can be followed northward to the Trigo Mountains Wilderness Area. This wilderness is hemmed in by the Yuma Proving Grounds and the Imperial NWR, and is seldom visited. 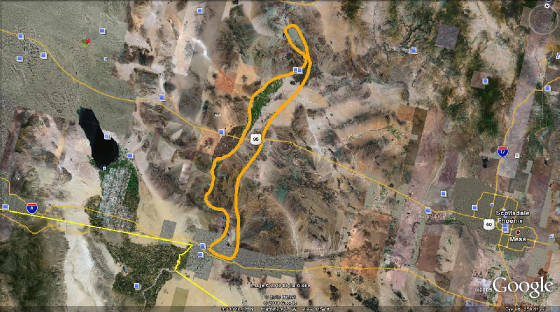 The 14 miles of the Trigo crest line are bisected by the Clip, Red Cloud and Hart Washes. There are few if any trails or old roads in the area. Cibola Road leads northerly from Martinez Lake and heads toward the Cibola National Wildlife Refuge (NWR) and the town of Cibola. This 50-mile long unpaved road is not for an RV, but is a dirt-road traveler's delight. One of many ghost towns along the river is 31 miles upstream from Fisher's Landing. Clip was named after the nearby mine that was the purpose for the community. Two hundred hearty soles lived here and most worked in the silver mine. A post office served the residents from 1884 to 1888. The mine was productive, yielding over $1 million in silver before it played out. Norton's Landing is a stopover on some of the river tours, and is only accessible by boat. It was originally a stopover for the paddle-wheelers providing supplies for the Red Cloud Mine. The former town site along the river was named for G. W. Norton, and for a time had a bridge across the Colorado. A post office operated from 1883 to 1894. Most of the town site was inundated by river damming, but some foundations and mining debris remain. Today the Landing is owned by Yuma River Tours, and they offer river tour customers picnic and overnight camping areas, restrooms, a gift shop and many artifacts from bygone days. Canoeists and kayakers often plan a stopover at the historic site. Back on Highway 95, we resume travel northward. Castle Dome Mine Road intersects with 95 and leads to the ghost town of Castle Dome. The Castle Dome Mining District is one of the oldest District's in Arizona, having been established in 1862. It wasn't the stunning mountains that attracted people, it was the valuable ore found here. Silver and lead were mined here in the late 1800's, and the mine operators actually built a road from here to the river just south of Fisher's Landing. There they established the Castle Dome Landing, which became a stop for the paddle-wheelers trolling up from the Gulf of California. Mining didn't last long here. The silver played out fairly early, and the lead wasn't anywhere near as valuable. Translucent purple fluorite is a by-product of mining, and can be found here scattered amongst the mining litter. Calcite, Galena, Quartz, Wulfenite and possibly Vanadite can also be found here. The abandoned Hull Mine is in one of the primary mining areas in the District. The mine does not have timber supports, which is actually a good sign. The miners felt the surrounding rock was strong enough to support the shafts without any additional support. The presence of wood timbers in mine shafts should serve as a warning that the shaft could be unstable. If it was unstable back then and needed supporting, it is likely even less stable today. Be forewarned if deciding to enter any mine shaft. Here you can explore mines hundreds of feet into the mountain, assuming a predilection to do so in the first place. Stale, oxygen-depleted air is another threat in abandoned mines. This can lead to grogginess and a loss of orientation and energy. Mine shafts should never be explored alone. The town of Castle Dome sprung up as a result of the mining activity. A post office served the residents for only one year, closing in 1876. You can learn about the extensive mining in this area at the Castle Dome Mines Museum. Today twenty of the town buildings have been restored, and many mining artifacts are on display. The buildings include a hotel, saloons, an assay office, the sheriff's office and jail, a blacksmith shop, and others. The museum has many more artifacts, including Levi's jeans over 100 years old. The museum charges a small fee to explorers of the town and surroundings, and it is well worth the price. 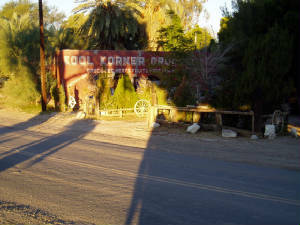 The mine and museum are located on Castle Dome Mine Road off Highway 95, about 40 miles north of Yuma. If you come here as a camper or rock hound, please obey any private property and posted claims in this area. Back on Highway 95, we continue northward toward Quartzsite. 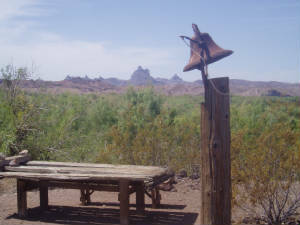 The Kofa National Wildlife Refuge begins about 40 miles north of Yuma. A number of mines were established in the Kofa Mountain Range in the late 1800's-early 1900's. Chief among them was the King of Arizona Mine, which gave the mountain range its' name, "Kofa" being contracted from King of Arizona. 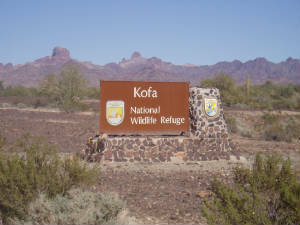 The Kofa NWR was established in 1939. The Kofa and Castle Dome mountain ranges are part of the 665,400 acres that make up the NWR. A herd of approximately 1,000 Bighorn Sheep live here. They are generally secretive and very nimble, galloping across impossible slopes and rocks. Several natural and man-made water sources sustain the herd. Desert Tortoise, Desert Kit Fox, and a large variety of birds make Kofa home. A rare plant called the Kofa Mountain barberry is found on the Refuge. Eighty-two percent of the acreage was declared wilderness in 1990. One of the most popular visiting spots in the Refuge is Palm Canyon, where a cluster of California Fan Palms thrive. The palms can be seen and photographed from a viewing point a half-mile from the parking area, but direct access to them should only be attempted by people acclimated to strenuous hikes. Hiking and camping is permitted anywhere on the Refuge, although vehicles must stay within 100 feet of established roads. More than 300 miles of dirt roads criss-cross the Refuge, but most are accessible only to high-clearance and/or all-wheel drive vehicles. Camping is not permitted within a mile of watering holes. The Engesser Pass Trail is a long path that goes through the Refuge. It begins at the east end of King Valley Road in the Kofa Mining District, and can be combined with Bighorn Pass to make it a loop drive. The road passes through a wide variety of scenery, past current and abandoned mines (obey No Trespassing signs), and takes you through Hoodoo Wash leading to the historic Wilbanks Cabin. High clearance 4WD vehicles are recommended, although most stock SUV's would find the trail accessible. The Big Eye Wash Trail also begins in the NWR. The trail begins off Castle Dome Road near the Museum and quickly becomes a single track. It runs southeast along the mountains, passing by the Colorado Mine with its' adits and wood-lined shafts. Crosses mark an unnamed cemetery across from the Mine. The Trail passes through beautiful desert scenery with panoramic views of King Valley and the Tank Mountains. High clearance vehicles are recommended, and 4WD may be required. 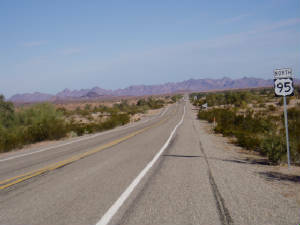 North of Kofa, Highway 95 continues northward through pristine, unpopulated desert scenery. South of the small community of Stone Cabin, a dirt road leads westward 45 miles to Cibola Lake and the Cibola NWR, mentioned earlier. This road can be followed to the original town of Cibola, now a ghost town. The town was formed in the Cibola Valley in 1898, about 16 miles east of present-day Cibola. 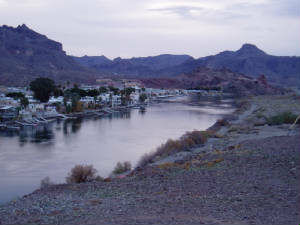 A 16-mile long canal was built to bring Colorado River water to the town. The town served farmers in the area, and a post office operated until 1933. All the remains are on private property, and permission is required to visit the site. This part of Arizona is home to the smallest owl in the world, the Elf Owl (Micrathene whitneyi). 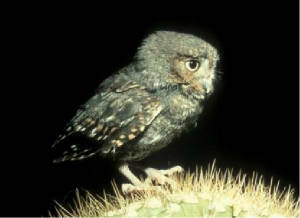 The Elf Owl nests in Saguaro cactus and occasionally in cottonwood trees near the river. It is a nocturnal, migratory owl the size of a sparrow. Its normal range is from central Mexico north to southern Texas, central Arizona, and the southern tip of Nevada and along the California side of the Colorado River. Its normal diet consists of insects, spiders, scorpions and small mammals. Most prey is captured in flight, due to their high degree of flight maneuverability. They migrate to Mexico in September, and return in March. They are occasionally attracted to campfires, apparently chasing insects drawn by the light. The most important threat to the Elf Owl is the loss of riparian and desert scrub habitats. The original habitat along the full length of the Colorado River was cottonwood/willow. Very few areas of cottonwood/willow remain in the southern end of the river, replaced by agriculture and invasive exotic plants. Urban areas are encroaching on desert scrub habitat almost everywhere. The work that the Imperial and Cibola NWR's are doing to restore native habitat can be incalculable when it comes to saving many species of plants and animals from extinction. The New Water Mountains Wilderness Area is between the Kofa NWR and I-10 east of Highway 95. About 20 old roads through the area are now closed, but can be explored on foot. A large volcanic butte called Black Mesa looms over the Ranegras Plain at 3,639 feet above sea level. New Water and Dripping Springs are prime lambing areas for Bighorn sheep. There are many colorful craggy spires, sheer rock outcrops and natural arches in the wilderness. The western end of the area can be reached via Gold Nugget Road south of I-10. As we approach Quartzsite, we enter the La Posa Long Term Visitor Area (LTVA). Here you will begin to see hundreds of RV's camped off the road, especially in the winter. The attraction for spending tens (if not hundreds) of thousands of dollars on an RV, securing the homestead, driving thousands of miles and parking next to the highway for months at a time, amidst others doing the same thing, is lost on the author. But it is an obvious life style attraction for literally thousands of people. The La Posa LTVA straddles both sides of Highway 95 less than a mile south of town. The fee is $5 per day or $50 annually for an up to 7-month stay (between September 15th and April 15th). Additional fees may apply. South La Posa is the main area, and has water, dump and garbage disposal. West La Posa has garbage disposal only. Tyson Wash has garbage disposal, rest rooms and a telephone. All of the locations have BLM personnel at their main entrances. Some of the plots are within walking distance of Quartzsite. In the winter high temperatures are typically in the 60's, but low temperatures can approach freezing. BLM enforces a slew of rules and regulations pertaining to LTVA use. The best site to review them is http://www.blm.gov/. 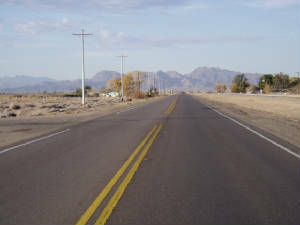 Highway 95 intersects with Interstate 10 in the town of Quartzsite Arizona. Quartzsite was founded in 1867 at the site of old Fort Tyson. Fort Tyson was built in 1856 by Charles Tyson for protection from Indian raids. Water was found nearby and Tyson's Well was dug. The site served as a stage stop between Ehrenberg and Prescott for a period of time. The town that sprung up nearby was named Quartzsite after the quartz found in the hills, and the name evolved through a spelling error. Hadji Ali came to Quartzsite in 1856. He was a camel driver. His name was hard to pronounce, and evolved into "Hi Jolly." He came to Quartzsite with the U. S. Army, which was conducting an experiment using camels as desert pack animals. Lieutenant Edward F. Beale had successfully lobbied Congress for a $30,000 appropriation from Congress to try out the famous "ships of the desert". Funding for the Camel Military Corps was approved in 1853. It took a while to acquire and transport the animals to Texas and then to train local men to handle the obnoxious beasts, one of whom was Ali. Beale's caravan strode across much of the Yuma Territory, including the area along the river. One day, while trying to figure out how to get the animals across the river to California, Beale was surprised to see a steamboat on the river. It was Captain Johnson and the General Jesup, on their way back from their upstream expedition. Beale was most surprised, the Jesup being the first such steamboat to get this far north, and most pleased for another reason. His camels could not cross the river while fully loaded. An amused Johnson agreed to transport the men and supplies to the other side, making a swim by the unfettered camels possible. Beale's camel caravan ultimately opened up a major wagon route across the territory until funding finally ran out. Ali, who later changed his name to Phillip Tedrow, kept several camels and used them to transport freight across the desert.  His venture faltered later, and in 1868 he cut his animals loose near Gila Bend. Camel sightings were reported for many years thereafter. Ali is buried in the Quartzsite cemetery, where a monument marks "Hi Jolly's Last Camp." Mining activity dominated the Quartzsite area later in the 19th and into the 20th century. Various mining sites were inhabited by as many as hundreds of individuals and families, searching for minerals. 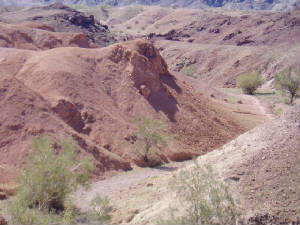 Remnants of mining sites can be found in and around Quartzsite. In the 60's Quartzsite was a sleepy town occupied by a flock of snowbirds and RV'ers. Things around Quartzsite had become a little stagnant, so resident Glen Fulton called a meeting of the townsfolk. Soon thereafter the Quartzsite Improvement Association was created to draw attention to the natural attractions. Rocks and gems were made the center of attraction, and soon the Pow Wow Rock and Gem show debuted. The rest is history. In January and February thousands of people flock to Quartzsite to attend the annual rock and gem shows that abound. The so-called "flea markets" (or swap meets) are scattered throughout the city, on vacant lots and on city sidewalks. So prevalent are the temporary shops that it is reminiscent of a south-of-the-border shopping experience. During the rock and gem shows and swap meets, Quartzsite can be extremely crowded. Lines of vehicles 2-3 miles long on adjacent highways waiting to creep into town are common. Today about 3,600 residents make Quartzsite their permanent home. From Quartzsite, Interstate 10 heads west and US Highway 95 shares the roadway to Blythe. The paved road north from Quartzsite becomes State Highway 95. To stay near the river, we will follow I-10 to Ehrenberg, and go north on the Ehrenberg/Poston Highway to Parker. Ehrenberg Arizona is about 18 miles west of Quartzsite. 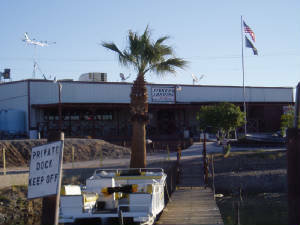 The Bradshaw Ferry Landing served as the original township location, and the original name was La Paz. Thousands of prospectors came to La Paz via the Bradshaw Trail during the Gold Rush of the 1860's. Thirty to fifty people would cross the river to La Paz a day. The trip from San Bernardino California would set a passenger back forty bucks. The prospectors flocked to the hills outside La Paz, pock marking them with mine shafts and mining claims. As many as 5,000 people called La Paz home, which had spread to cover 270 city blocks. Along with the prospectors came the usual collection of followers. Girls, gamblers and shysters all were looking to separate a guileless prospector from his gold nuggets. By 1870 most of the gold had been mined, and La Paz began to decline. The railroad had replaced the crossing, arriving in La Paz in 1877, and the paddle wheelers which used to stop nearly every day now were stopped themselves by the Laguna Dam. The town died almost as fast as it had blossomed, and today only one water well and a few foundations are all that remain. La Paz was later renamed Ehrenberg in honor of local mining engineer Herman Ehrenberg. Today Ehrenberg is a gritty, no-nonsense community with a population of about 1,300 (2000 census). The River Breeze RV Resort in Ehrenberg offers 94 sites with full hookups, 43 64x40 pull-through sites, tent and triple-slide-out sites, concrete pads and shaded grassy areas. The facilities include a boat ramp, laundry facilities, a heated pool and spa, laundry facilities, propane gas, and more. No rates were listed on their web site (http://www.riverbreezerv.com/). The listed phone number is 928-923-7483. Reservation information can be inquired via E-Mail to riverbreeze@i10net.com. 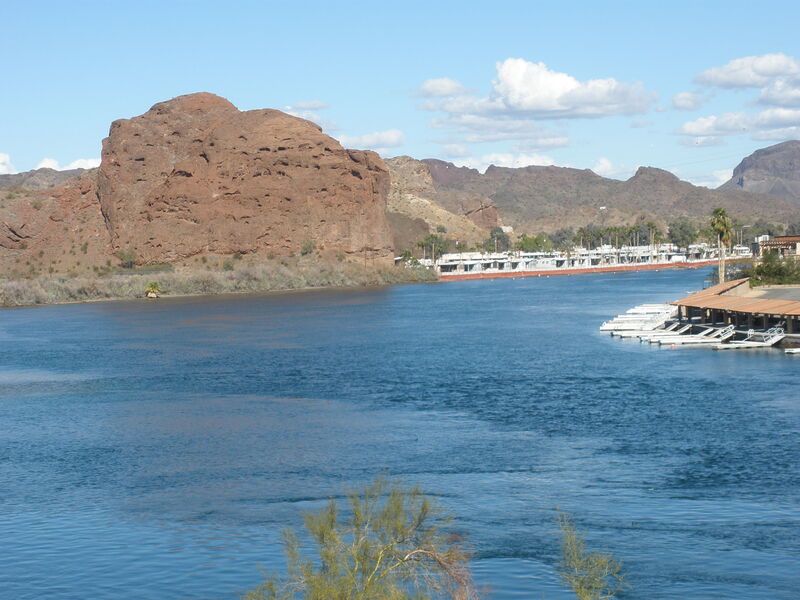 The Colorado River Oasis RV Resort is also located in Ehrenberg. They offer 150 full hook-up sites and 50 amp service, cabins, a boat ramp and swimming area, laundry and showers, and a store. They have an activity schedule that includes live entertainment at certain times of the year. Their rates begin at $30 per night, with some surcharges and some discounts available. The maximum stay is two days, and reservations are not accepted. Their web address is http://www.westernhorizonresorts.com/, and their phone number is 928-846-3421. The Ehrenberg Sand Bowl OHV Area is just south of Ehrenberg on Ehrenberg/Cibola Levee Road. Approximately 2,000 acres of sand dunes are open to vehicular travel. Permits are required to enter the area, and fee amounts are available at the self-serve kiosk in the parking lot. Annual permits are available from the Yuma BLM office or from the host at the Oxbow Campground, 20 miles south. 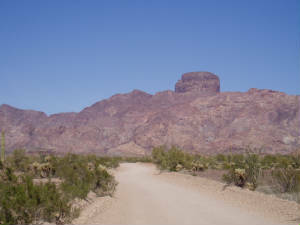 The road leading northward from Ehrenberg is variously called the Ehrenberg/Poston Highway, Mohave Road, Parker/Poston Road, and Indian Route 1. Residential streets and cultivated fields give way to desert expanse north of Ehrenberg. Although the Ehrenberg/Poston Highway parallels the river, there are few recreational facilities near here. Some dirt roads lead directly to water, but there are no improvements on the Arizona side. Being within the Reservation boundaries, it would behoove anyone wishing to explore this area further to check in with any Tribal authority first. The Colorado River Indian Reservation was created in 1865, and encompassed an area from five miles north of Ehrenberg to fifty miles south of Parker. The Reservation covers 264,000 acres, and residents include members of the Mohave, Chemehuevi, Navajo and Hopi tribes. In 1867 Congress granted $50,000 for the development of the Indians' Grant-Dent Canal, which was completed in 1871. Irrigation commenced, but not without hardship. Beset with canal cave-ins, alkaline water and poor drainage, there were dismal failures in the early years of agricultural development. In 1914, only 600 acres of Indian-owned land were being irrigated. Subsequent irrigation improvements, including improved drainage and construction of the Headrock Gate Dam in 1941, resulted in 5,000 arable acres. Other agricultural improvements over the years increased the arable acreage to over 38,000. Cultivated fields resume after entering the Colorado Indian Reservation leading to the town of Poston. Poston is known for the Relocation Camp located there during World War II. Camp Poston actually was comprised of three sites, known as Poston 1, 2 and 3. Because of its' location on an Indian Reservation, the Camp was operated by the Office of Indian Affairs (Bureau of Indian Affairs today) rather than the War Relocation Authority. The Camp was comprised of 71,000 acres, and during the height of activity housed 17,814 people. The most notable occurrence at Camp Poston was known as the Poston Strike. The strike manifested itself after long-brewing tensions in the community were made worse in the camp environment. The strike resulted in violence, and the Assistant Director of the Camp was forced to negotiate a compromise. The strike lost momentum soon thereafter, but became a notorious footnote in the history of the Japanese/American Relocation effort. All three camp locations finally were closed by September 1945. Of the three Camps only Poston 1 has significant remains, consisting of several barracks buildings, the gymnasium, and a few other buildings. A large monument and kiosk were dedicated along Mohave Road near Poston in 1992. Today Poston is a small unincorporated community with 389 permanent residents. The surrounding area is all within the Colorado Indian Reservation, owing to Poston's high percentage of Native Americans. Continuing north on the Ehrenberg/Poston Highway, Agnes Wilson Road intersects a few miles north. The westerly stretch of Agnes Wilson Road crosses over into California, the only bridge between Highway 62 and Blythe/Ehrenberg. Ehrenberg/Poston Highway veers easterly following the course of the river, and enters the town of Parker. Parker was founded in 1908 and incorporated in 1948. An initiative petition approved by voters in 1982 created La Paz County out of northern Yuma County, and Parker became the County Seat in 1983. The population after the 2000 census was 3,140. There are ten hotels and RV Resorts in Parker, of all price ranges and accommodations. The 16 miles around the river near Parker is known as the Parker Strip. The river here is actually called Lake Moovalya, the currents being backed up by the Headgate Rock Dam further south. It is more a "swollen river" than a lake. The town was named after Eli Parker, a Seneca Indian chief. The town was moved to the railroad tracks four miles north of the original location in 1905. The new town site was laid out by an engineer by the name of Earl H. Parker. So it became that the naming of the town had origins in two people named Parker. River recreation dominates the tourism industry in Parker today, but it wasn't always so. Parker was originally a railroad stopover, until agricultural development began in 1867. Parker had a population of 90. The economic emphasis of Parker was changing along with the irrigation developments, evolving from freight and mining to agricultural, and eventually to construction and administrative support for the many federal river projects along the river. Parker Dam was one of the federal river projects. It was completed in 1928 and resulted in a 700 foot wide, 16 mile long lake. Once again, the character of Parker changed to service and tourism. The Snake Intaglio is about 10 miles east of Parker. As mentioned earlier, intaglios are examples of Indian earthen figures also known as geoglyphs. The purpose for them is still being debated, with the prevalence of thought being artistic expression. 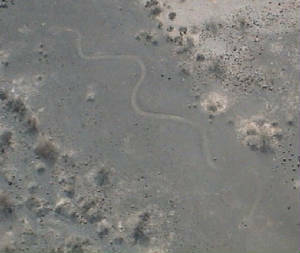 The Snake Intaglio can be accessed from Shea Road, just south of an intersection with a dirt road. Look for beehives nearby. The Arizona and California Railroad passes through Parker. The tracks were originally constructed between 1903 and 1907, and at that time were a subdivision of the Atchison, Topeka and Santa Fe line. The segment between Parker and Matthie, Arizona was completed in 1907. In 1910 the line was extended westward to Cadiz, California, and connected with other lines heading west. In 1991 the line was purchased by the ParkSierra RailGroup and renamed the Arizona and California Railroad. RailAmerica Inc. purchased the ParkSierra RailGroup in 1992, and is the current owner of the line. The line provides direct access to Phoenix from Los Angeles. Seventy-five percent of the cargo is through-freight containers from the ports to Phoenix and back, with hay, LP gas, lumber and other commodities making up the remaining 25%. 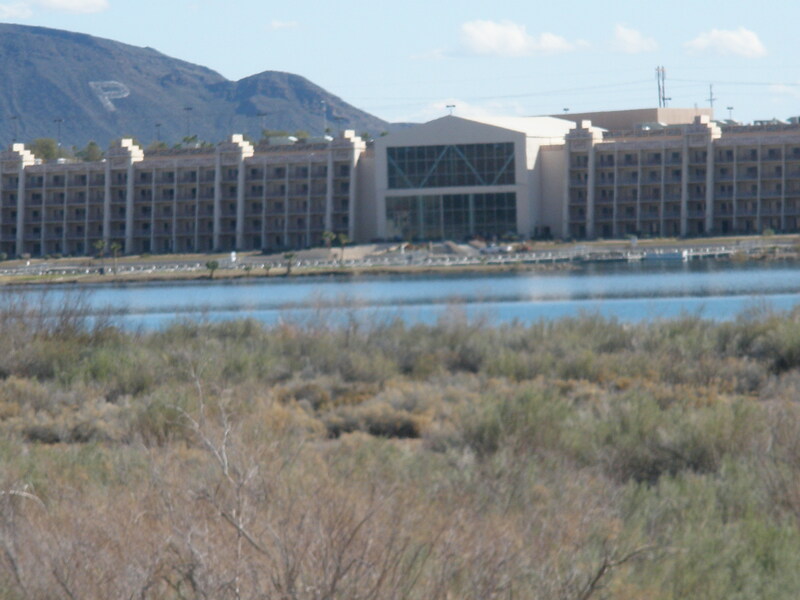 The BlueWater Resort and Casino is located on the shoreline one mile north of Parker. The Aztec-themed resort has 200 rooms, an indoor water park, four-screen Theater, outdoor amphitheater, several restaurants, a large boat marina and gaming area. The Bluewater Resort is a focal point for community events and celebrations and celebrity entertainment year-round. For more information, visit their web site at http://www.bluewaterfun.com/, or by calling 888-243-3360. Community events occur in Parker most every month in the year, ranging from the Offroad Racing Season in January, the Parker Enduro Speedboat race in May, the annual Inntertube River Float in June, and the International "Airchair" Championships in September. The Parker 400 Desert Race has been held since the 1972. Originally known as the "Big River 400" then the "Dam 400", the 136-mile long race, sponsored by the Bluewater Resort is usually held in late January or early February. Thousands of spectators come from hundreds of miles away to watch dozens of racers tackle the course. The highly specialized and heavily sponsored vehicles tear through the desert tracks, some flying through the air as they head for the checkered flag. Off-road tours around Parker are available from Colorado River Buggy Expeditions. Tours leave daily from Main Street Park with eight passengers, and last about four hours. The open-air buggy visits desert and canyon areas along the river, with emphasis on the zoology, botany, geology and history of the area. The price is $75 per person. Information and reservations can be made at http://www.explorearizonatours.com/. The Colorado River Indian Tribes (CRIT) Museum and Library has relics, artifacts, history and information on all four of the Tribes that make up CRIT: The Mojave, Chemehuevi, Navajo and Hopi. The museum displays an array of Indian craft works including baskets, Hopi Kachina dolls, jewelry and pottery. The museum is at the corner of 2nd and Mohave Roads off Highway 95. The Parker Historical Society Museum is located at 1214 California Avenue. This museum displays antiques from the mining days as well as Indian artifacts. Photos of the construction of Parker Dam are also on display, as well as information on the WWII Internment Camp in Poston. Heading northeast from Parker, we pick up State Highway 95 again, which parallels the river and passes Marina Loop Drive with more recreational facilities, and Parker Dam. The Arizona State Parks Department manages the River Island Unit Campground, part of Buckskin Mountain State Park. Parker Strip near Buckskin Mtn. State Park on a rare cloudy day. 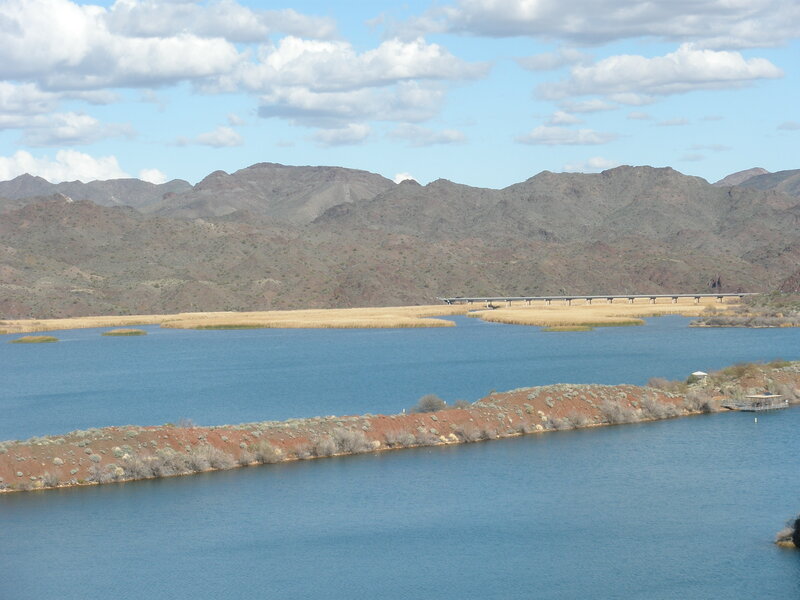 The campground is located about five miles south of Parker Dam. Sixty-eight sites are offered, ten with electricity and water and five with full hook-ups. The campground has a group-use area with ramada, sandy beaches, restrooms with showers, a boat launch and horseshoe pits. Campsite fees are $20 per night per vehicle, which includes water and 30 amp electrical services. Sites with sewer are $3 more per night. Cabana fees are $23 per night, (April through October) and $20 per night (November through March), with 15 amp service. River island campsites are $22 per vehicle per night, and the day-use fee is $8. This campground is extremely modern, clean and efficiently run. Trails lead to a foot bridge over the highway and to abandoned mines nearby. An interpretive center, boutique, market and restaurant are available on-site. The phone number for reservations is 928-667-3231. The Buckskin Mountain Trail is a challenging drive to a place the locals call the "Desert Bar", better known as the Nellie E. Saloon. People come from all over to visit this unusual attraction in the middle of nowhere. The name originated with a mining camp where copper was mined. 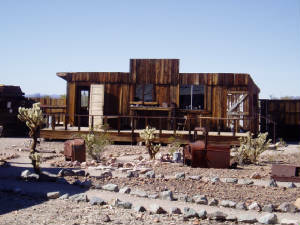 The saloon was completed in 1988, and has many unusual features including windows made from old glass refrigerator doors and steel bar stools that sway from side to side. Across from the saloon is an outdoor bar and stage, and a horseshoe pit is behind the outside bar. A church was built in 1996, and is made of solid steel. The walls and ceiling are made of the same stamped tin used inside the bar, and the roof is made of copper. The church is a great photo-op and a unique place for a wedding. 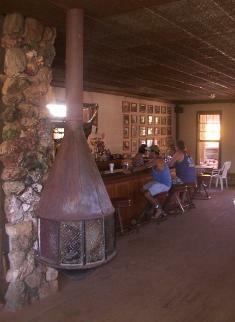 The saloon is located off Cienega Springs Road five miles north of Parker. The Castle Rock Shores RV Resort is located 11 miles north of Parker and just south of Parker Dam. The resort offers bungalows and RV sites with full hookups, summer and winter rates, weekend, weekday, weekly and monthly rates, and storage. Extra charges for cable TV, 30 and 50 amp service, extra vehicles and boat launch apply. Reservations can be made on-line at http://www.castlerockshores.com/. The toll-free phone number is 800-701-1277. Their E-Mail address is info@castlerockshores.com. Take-off Point is located immediately adjacent to Parker Dam. A boat launching ramp and handicapped-accessible fishing pier are available. 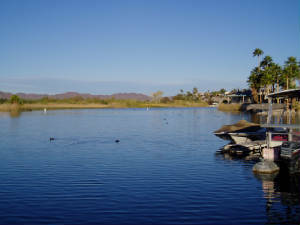 The site offers restrooms, a few dry campsites, and excellent views of lower Lake Havasu and the rugged mountains flanking the lake. The Bill Williams River empties into the Colorado River just north of Parker Dam. After Parker Dam, Highway 95 turns due east and winds above several rocky coves, passes some exclusive new property developments, and drops down towards the estuarine mouth of the Bill Williams River. The Bill Williams River drains a large portion of Arizona from the Alamo Reservoir to the Colorado. Where the rivers meet the land is level, with a large riparian area. A bridge on the 95 crosses over the river, and there is an overlook of the riparian area just past it. A gravel road leads upstream from the mouth of the river for about three miles, through several steep ravines, then across flatter land. A cottonwood/willow forest populates the river banks, one of the last stands of this tree community along the Colorado River. The upper gorge area is quite different, where the waters flow through steep canyons and sheer cliffs. 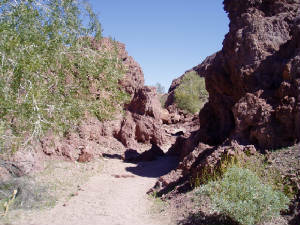 Access to the upper gorge is by way of Lake Alamo Road, off US 60 at Wenden. 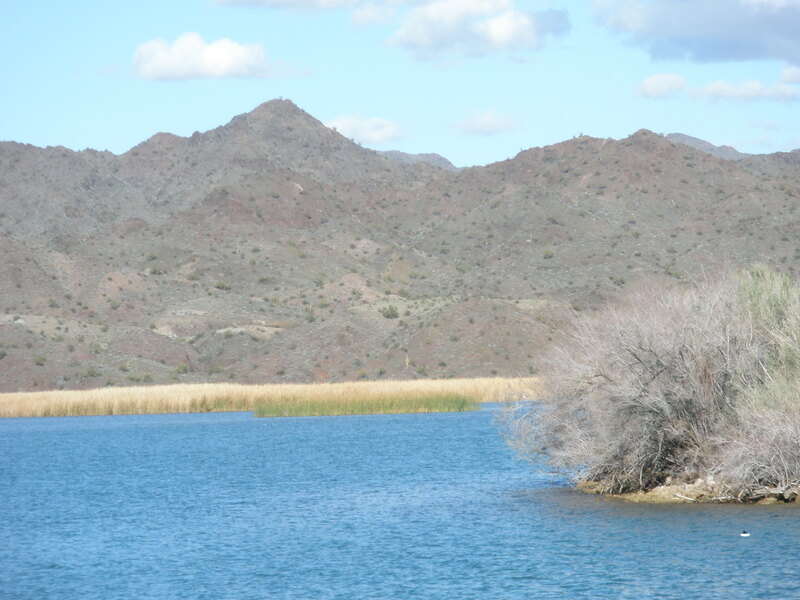 The river and refuge get their name from a mountain man who traveled through much of Arizona in the 1800's. When he came west from St. Louis, Williams was a missionary to Native Americans. In his later years he gave up the missionary and became a trapper and traveler. Williams is thought to be buried in an unmarked grave near Williams, Arizona, but his cause of death and the year he died remain a mystery. 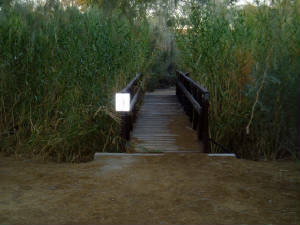 The Lake Havasu access site to the National Wildlife Refuge (NWR) was dedicated in 2003. Ramadas and interpretive trails welcome visitors. The U. S. Fish and Wildlife Service is active raising two threatened native-Arizona fish species at the NWR. 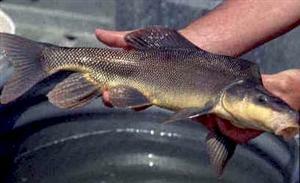 The razorback sucker and the bonytail chub were once prevalent in the southwest, but are now threatened by loss of habitat. Razorback sucker. Courtesy Colorado Division of Wildlife. The Dexter National Fish hatchery produces the fish at their plant in New Mexico and provides them to the NWR. They are raised in a cove at the Refuge until they reach a size of about 10 inches, when they are better able to defend themselves against predators. At that point they are released into Lake Havasu and other areas, and their status and survival rate monitored over time. As along other reaches of the Colorado, officials at the NWR are working with the Army Corps of Engineers to restore the water flows of the Bill Williams River to a more natural state. Like other NWR's along the Colorado, the list of migratory birds that pass through the Refuge is extensive. Cottontails, javelina, and deer, as well as predatory coyotes, bobcats, and the less common mountain lions, can also be found here. Back on Highway 95, the roadway parallels Lake Havasu. A few miles north of the bridge over the Bill Williams River, a turnoff leads to Cattail Cove State Park. The park offers 61 campsites right on the lake. No wood fires are allowed, but charcoal for cooking within a campsite or on a grill on the beach is permissible. A broad swimming beach and boat launch attract boaters to the campground, but there are other features. Whyte's Retreat Trail takes you one and a half miles through the shoreline cliffs to the south. The trail begins on the south side of the boat launch ramp. Overnight camping fees range from $19-$25 for an electric site, and $10-16 for a cabana or boat site. The entry fee for day use is $9 per vehicle. The phone number at Park Headquarters is 928-855-1223. Highway 95 continues northwestward, and we enter the town of Lake Havasu City.